Happy Bloggers Challenge Friday! This weeks challenge is a color challenge, use Kiwi, Blue and White. A pretty color combination if I do say so myself! I can see this color combination being used with many stamps. Using it as a Technique, or just a nice CAS design. I pulled out some Blue, Kiwi and White card stock, then settled on Bermuda Bay as my shade of Blue, I love this rich shade of Blue. I also pulled Black as a neutral into my card pop my panels. 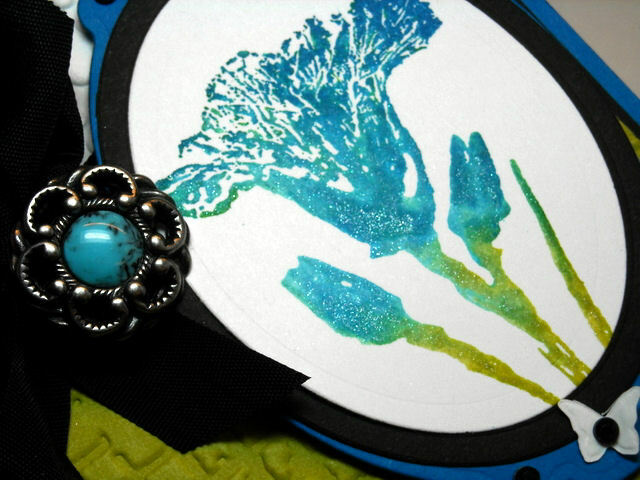 The beautiful flower image is from Fred B. Mullett (item FBM_365), inked in Bermuda Bay and Kiwi then spritzed with Pearl Glimmer Mist before stamping on the White panel. I used Spellbinders Oval Dies to cut out the image, layered on a Black Oval then Bermuda Bay panel cut from Labels Ten. On a side Note....Fred Mullett will be on the road teaching Classes starting in early July. If you've been thinking of ordering, all orders must be placed by July 7th. After that date, the studio will be closed until early October. Click here to order. The Kiwi and White panels are embossed using the Big Shot and Texture Fades Folders. To embellish my card, I used some Black Seam Binding, Stick Pin, a button from the Accoutrement Line by Tim Holtz and a few butterflies using the Beautiful Wings Embosslit. Congrats! Please use the email me by July 3rd to claim your prize. If your looking for more inspiration using this weeks color challenge, click the link on my sidebar to see what the other players created this week. I love that color combo and all the techniques used on this card, it just pops off the page. Excellent job. Lisa, you are exactly right, gorgeous colors together and the black really sets it off. 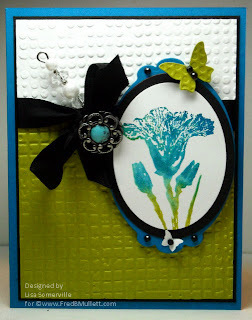 Another gorgeous card, and the embellishments are perfect! Very pretty, Lisa. Perfectly executed! Great color challenge. Those colors go well together. Congrats to the winner of the stamp set. I truly think this is breathtaking -- the colors are awesome and I think that big of black ribbon only sets the whole thing off. This is stunning! Love all of the baubles, buttons and bling, Lisa!! Your signature black is a perfect finish with that ribbon! Georgeous color combinations! Beautiful right down to the bling! 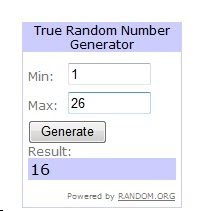 Congratulations to the lucky stamps set winner!! I LOVE this color combo! You are right, it could be used on a lot of many different stamps! I love how you mix the textures on your cards. That added butterfly is wonderful. Those buttons and pins from Tim Holtz are just amazing! Lisa, this whole card is fantastic. Thank you for sharing it with us/me. And, to the winner... Congratulations! Really nice Lisa. I agree Bermuda Bay goes great with Kiwi! Beautiful card Lisa. Love the texture from the embossing and that flower image is awesome. The colors worked great with your image and embellishments. This is stunning!! Oh so gorgeous!! Such a striking card! Stunning! love the flower and the details! Very handsome artwork!! Love the button & all the textures! Truly beautiful. The image, the embellishments, the texture are so rich. Lisa, this is beautiful! The vivid blues make the flower pop against the rest of the card. Love all of the little details you added, too. What a beautiful card and I love the colrs!! Gorgeous card Lisa! I love the rich colors and the embossing. Ohhh this is STRIKING, Lisa. Love this color combo! Love all the little touches. The varying textures make this truly a beauty. Lisa your card redifines the term brilliance...your really rocked your challenge.. Stunning use of the colors! love the flower and the design is fab! How lovely! Great image and I love the embossed background....perfect together. Great choice of blue. What a pretty flower too. The black really makes it pop!